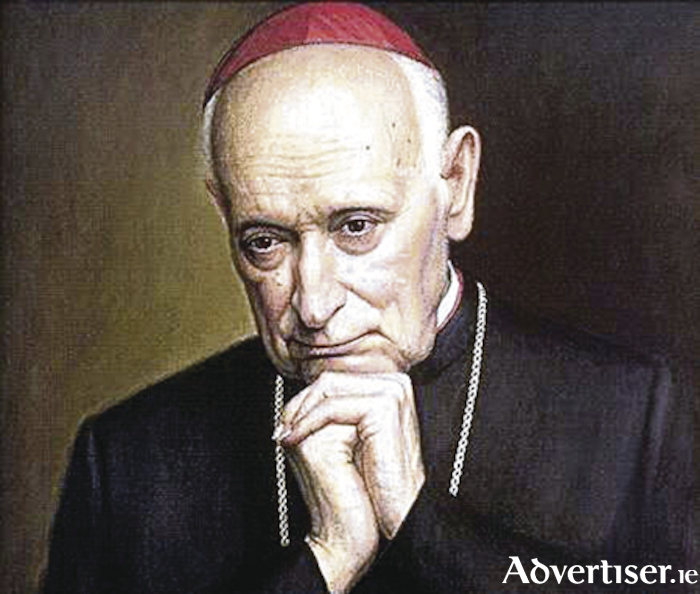 Cardinal Mindszenty had a deep devotion to the Irish Madonna. It is perhaps an indication of how Ireland was cut off from the rest of the world that no one here knew about the painting of the Virgin and Child, and its miraculous ’tears of blood’, that Bishop Walter Lynch brought with him to Gyor* in Hungary, in the middle of the 17th century. Bishop Lynch became an exile following the Cromwellian invasion of Ireland, and the surrender of Inishbofin where he had taken refuge following Galway’s capitulation in April 1652. Walter Lynch had been Bishop of Clonfert before Cromwell’s arrival, so it was natural that approaching the 200th centenary of the miracle of the ‘Weeping Irish Madonna’ that Bishop Zalka of Gyor wrote to Bishop Healy of Clonfert on December 22 1896, for more information about Walter Lynch. I take it that Bishop Healy was stunned! Two hundred years later that was the first he heard about the Irish Madonna. It opened a flood gate of articles, which appeared in the Irish Ecclesiastical Review, The Madonna, The Word, several Catholic dictionaries, and newspapers well into the last century, all accepting the fact that Bishop Lynch brought the picture with him when he was forced to leave Ireland. The idea that Bishop Lynch found a safe refuge in Gyor, and that his painting presented an astonishing miracle on St Patrick’s Day, found a particular resonance with the late Michael Browne, Bishop of Galway. ** Shortly after his appointment as bishop, and on the eve of World War II, he visited Gyor for the 34th Eucharistic Congress. He was immediately impressed at the devotion the painting inspired. There he met Jozsef cardinal Mindszenty, an uncompromising man, and leader of the Hungarian Catholic church. Mindszenty, who faced a life of imprisonment and and torture, had a special devotion to the Irish Madonna, which he knew was brought to his country by a man fleeing persecution. Hungary sided with Nazi Germany which Mindszenty fiercely opposed. He was imprisoned for most of the war. After the war he opposed the communist occupation, and the revenge it took on his country for siding with Germany. Again he was arrested, tortured, and given a life sentence following a 1949 show trial that generated worldwide condemnation, including a United Nations resolution. After eight years in prison he was freed in the Hungarian Revolution of 1956. When that collapsed he was granted political asylum in the United States embassy in Budapest for the next 15 years. Next week: Canon George Quinn spins a tale. NOTES: *Gyor is pronounced Jaur. ** Michael Browne served as Bishop of Galway and Kilmacduagh for almost 40 years from 1937 to 1976. ***Mindszenty was finally allowed to leave Hungary in 1971. He died four years later in exile in Vienna, Austria.